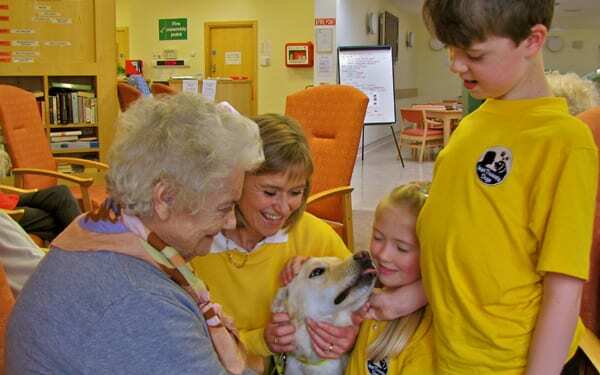 Approved and registered Volunteer Visiting Teams (Owners and their Dogs) devote one hour each week visiting their assigned Care Centres nationwide. Once they arrive, they discreetly circulate amongst the residents, and always include those who are bed-ridden or confined to their rooms. When a therapy dog enters a room you can watch everyone’s eyes light up. People smile. They might call to the dog and hold out their hand. The dog is a welcome visitor, bringing with it warmth and a gift for listening. At the same time a dog expects nothing in return. This interaction is a powerful thing to witness. You can stand back and simply watch as the positive energy fills the room. In the course of that hour, it is common for Care Centre staff to comment on the positive and visible changes in their residents. Sometimes, while petting a dog, residents respond positively, uttering words or using body language to convey their pleasure. Many volunteers will describe the joy their visits bring, and without exception, every participant is humbled by their experience. Volunteer Visiting Teams are fully insured for third party liability in the course of their visits.